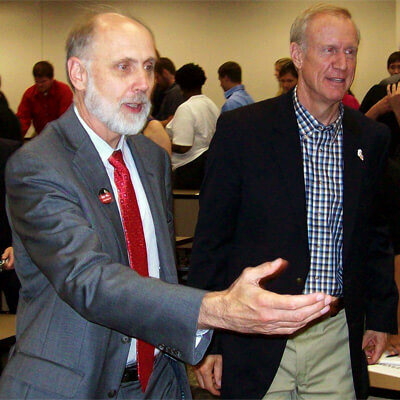 NIU President Doug Baker escorts Illinois gubernatorial candidate Bruce Rauner at the NIU College of Business Wednesday. Bruce Rauner took a break from the campaign trail Wednesday to discuss entrepreneurism with a group of NIU business students. Rauner, the Republican candidate for governor of Illinois, knows a thing or two about the subject, having earned billions of dollars as a partner in the venture capital firm GTCR, helping entrepreneurs bring their businesses to life. The key to good investments, he said, was to understand the industry that the entrepreneur was entering and to ensure the presence of top-notch leaders in all aspects of the business. Rauner, a Deerfield native, told the 60 students, most of whom are minoring in entrepreneurship, that they should treat every interaction in their life as an opportunity to network and always to guard their most valuable asset – their reputations. He also extolled the virtues of persistence. Denise Schoenbachler, dean of the NIU College of Business, approved of his message. Rauner was invited to the class by Eric Wasowicz, who teaches in the entrepreneuriship program at NIU and is a friend of Rauner.